Kom Ombo temple is a double unique temple that is located in the town of Kom Ombo 30 miles (48 km) north of Aswan governorate in Upper Egypt, that you can visit during your Egypt holiday packages or Egypt Nile cruises. It was established during the Ptolemaic dynasty, the Greco-Roman period from 332B.C until 395 A.D. This amazing double temple was in fact dedicated to Sobek “The Crocodile God” and Horus, the falcon-headed god. Every part of the temple id duplicated to two sets of gods. Everything in this marvelous temple is perfectly symmetrical along the main axis. The god Sobek is associated with god Seth, the enemy of Horus. According to Seth’s myth, the allies of Seth made their escape by changing themselves into crocodiles. The main sanctuary of Sobek was Kom Ombo Temple where there were once huge numbers of crocodiles. The local inhabitants of this area went in fear because of the dangerous animals and they believed that a totem animal is going to attack them. Everything inside the temple from texts and reliefs refers to the Cultic liturgies and the temple itself has a specific theology. There are two themes presented in the temple, the Universalist theme, and the local theme. Unfortunately, much of this temple was destroyed by the Nile River. Jacques Morgan restored all temples in the southern part of the plateau in 1893. In the Arabic language, the word Kom means “Hill” and Ombo in the ancient Egyptian hieroglyphic means “The Gold”. So in Arabic, it means, the hill of the gold. The word Ombo was actually the pharaonic word “Npty”, which means gold and in the Coptic period, the word changed to be “Enbo”, and finally, when the Arabic language became common, the word changed to be “Ombo”. The name of this astonishing city, which means “the hill of the gold” refers to the great importance of this city for the Ancient Egyptians from the economical aspect although the city wasn’t actually flourished except in the Ptolemaic era in Egypt. The Ptolemies have established a lot of military bases near the Red Sea, which fostered commercial activities between these bases and the Nile towns, especially Kom Ombo. This temple was constructed during the era of the Greco-Roman but the area had been inhabited since the pre-dynastic period of Egyptian history. Many ancient burial sites were discovered in and around Kom Ombo. 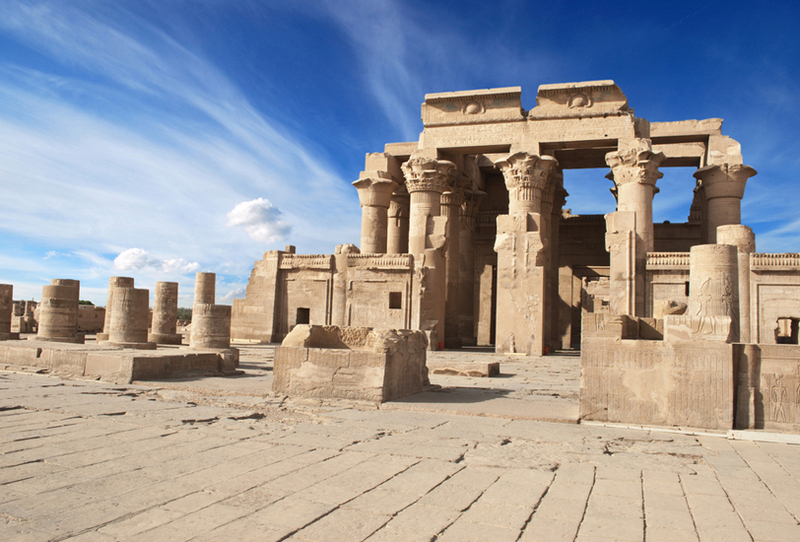 The most glorious days for Kom Ombo were when the Romans ruled Egypt. During this time, Kom Omo became the main administrative center and the capital of the province. The main target behind the construction of such an amazing temple by the Ptolemies was for the worship of two gods; Sobek and Horus and that’s why this complex has two parallel temples, which include all the traditional components of the ancient Egyptian religious structure. This temple was constructed using limestone in a design similar to that of the Greco-Roman period. There are three inner halls, and two sanctuaries; one dedicated to Sobek and the other to Horus and there is a courtyard and a hypostyle hall inside the temple. There are seven chambers in the inner halls; three are located in the eastern part of the temple and four in the western part. There are also antechambers and smaller rooms, which were used for different rituals and purposes. It is suited in the northeastern section of the temple. It consists of a rectangle shaped chapel that can be reached while climbing some steps and it is 5 meters long and 3 meters wide. There are three glass galleries displaying three mummies of crocodiles, which represent the god Sobek. There is a circular well in the northwestern section of the temple, which was used as a Nilometer to measure the water level of the Nile. These Nilometers had a great importance during the season of the Nile flooding. It is located in the northeastern section of the temple that was dedicated to the god Sobek, who was worshiped by many Egyptians during the Ptolemaic era. It was constructed in the third century A.D.